Getting a job today is hard. Everyone seems to be looking for one, and nobody seems to be hiring! If you find yourself in the same boat, it's time to ask yourself: do I need to get more creative with my CV? Our post on the subject: 'Brilliantly Creative Job Applications' way back in August 2011 has been one of the most popular on the blog ever, so we thought it must be time to find out how creative types have been getting hired since then. Going for an original online campaign will stand you a much better chance of getting hired. Or at least of going viral, which is fun too (though not nearly so well-paying). Florian Holstein went all out, or rather – all in with his attempt to woo sports behemoth Adidas. He so desperately wanted to work for Adidas that he created an entire website purely for the purpose of slapping an Adidas-shaped CV on it. It showcased his passion for sports, the company, and his work – and highlighted exactly how his work could help the company. 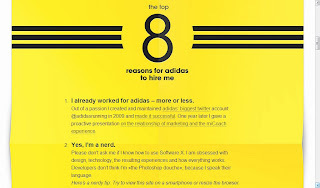 He also included a list of 8 compelling reasons Adidas should hire him. And, well – it worked. Florian was hired by Adidas in April 2012. Web space is a prime commodity in today's digital world, but personalised URLs are even more valuable. If you haven't already snatched up your own domain name, we recommend you do so immediately, lest some internet thieves whisk it out from under you. Which is precisely what Andrew Grinter and Lee Spencer-Michaelse did to some of Australia's biggest ad agency directors. The menacing pair claimed the URLs of the top ad execs and posted ransom notes on each of them, warning the directors to give them a interview, or “the site gets it.” And unsurprisingly, yeah, they did notch up a fair few interviews. A slightly gentler approach, creative duo American Alex and German Charli – a copywriter and a designer – sent out a different sort of threat. The threat to get married if nobody hired them – because Charli's visa was due to expire, and the team wanted to stay together so they could continue doing their best creative work together. The girls got their happy ending and were hired as freelancers. If you're passionate enough about a product to create an entire advert off your own back, chances are you're passionate enough about the product to work for the company that created it. Brandon Foy did exactly that with his beloved Windows Phone 7, and when Microsoft spotted it they liked it so much they asked him to make another one – with the promise that if it reached 200,000 hits on the 'Tube they'd air it on TV. The ad didn't make the cut, but Brandon did – Microsoft decided to hire him. The message here is pretty clear: get personal, get noticed, get hired. And show 'em what you can do! If you've got that great job already and you'd like help with an online campaign to get your business noticed, then contact the team at Art Division.